A unique shot of Atlantis surrounded by a flock of birds as it waits for launch. 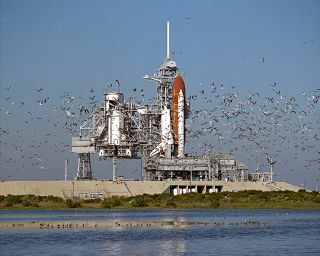 In this historical photo from the U.S. space agency, a flock of birds takes flight shortly after the Space Shuttle Atlantis arrives at Pad 39B after being rolled out from the Vehicle Assembly Building approximately six hours before. Atlantis is scheduled to be launched in late November 1988 on Space Shuttle mission STS-27, a Department of Defense dedicated mission. This will be Atlantis' third mission in space.